Jeep Grand Cherokee Performance Features | Eagle River Chrysler Ltd. If you're an SUV enthusiast, then we have something special to show you. The new Jeep Grand Cherokee, a popular sport utility vehicle, has some amazing performance features that greatly enhance the desirability of this vehicle. Here at Eagle River Chrysler Ltd. we'd love to discuss these features with you. This Jeep Grand Cherokee has a 6.4-liter V8 engine that can take this jeep from zero to 60 miles per hour in just 3.5 seconds. 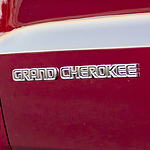 Combine this with a high-powered launch system and a torque reserve system, and this Jeep Grand Cherokee is ready to take you where you need to go. The patented Bilstein Adaptive Suspension System gives this vehicle the ability to quickly adjust the dampers for sport or track performance. The four-point axle mounting works to give added power and control to the wheels of the Jeep Grand Cherokee. These performance features really need to be seen to be believed. Come on by Eagle River Chrysler Ltd. for a test drive.